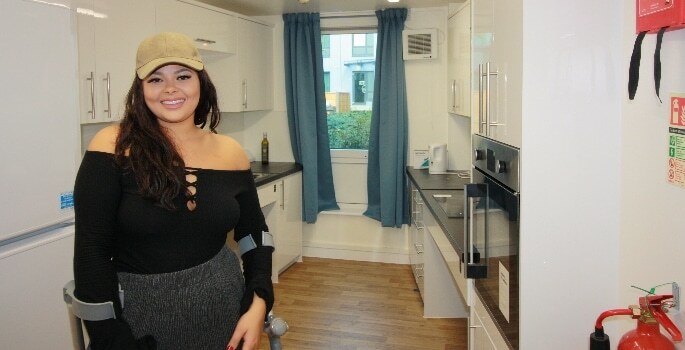 Students at the University of Greenwich have welcomed significant restoration work at their halls of residence, offering new and improved facilities including more bespoke housing for those with disabilities. The university enlisted Keepmoat Regeneration – part of the ENGIE Group, a provider of energy and regeneration services across Great Britain – to help future proof its student accommodation and make key upgrades. The project was completed early to allow for the wardrobes, bed frames and soft furnishings to be installed prior to the new students arriving for their first term. The 12-week programme saw Keepmoat Regeneration deliver new doors, bathroom upgrades, plumbing, kitchen refurbs and flooring at Devonport House and Cutty Sark Hall. In total, 42 en-suite student bedrooms, five communal kitchens, two staircases and associated corridors were fully refurbished. Greenwich Campus is located in the Old Royal Naval College area and its largest campus includes three baroque, Grade II listed buildings amid UNESCO World Heritage Site. Keepmoat Regeneration also worked with the university to design more improved and accessible DDA (Disability Discrimination Act) accommodation, which would support students with specialist mobility or care needs, to live more independently. A new DDA kitchen was also installed which incorporated carefully selected appliances, including an up-down oven. Ady Fisher, Contracts Manager for Keepmoat Regeneration, said: “This was a unique project and we’re delighted to have improved the students’ comfort and wellbeing. The University have shown a remarkable commitment to their students and invested heavily to ensure they have the best facilities. It’s fantastic to hear that Felicita, among other students, are happy with the finished product.